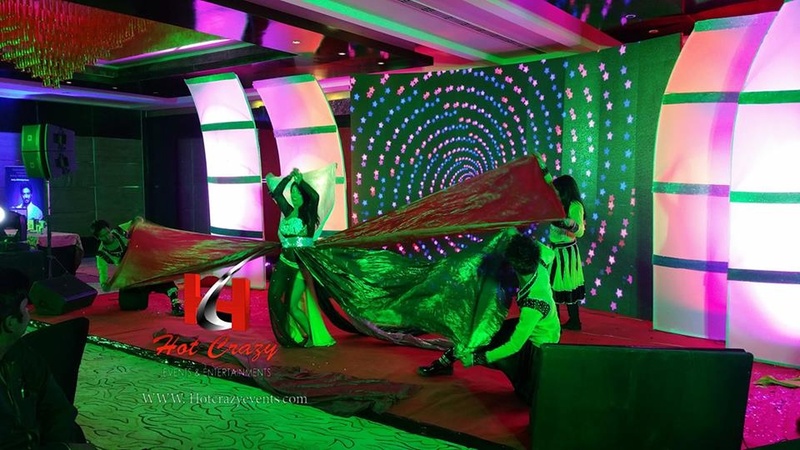 Hot Crazy Events & Entertainment is one of the most favored event management companies in Delhi. It offers complete entertainment solutions and helps clients host grand functions like weddings. Providing experienced anchors/comperes is a reliable service provided by the team. It also offers services of playback singers, comedians, bands, belly dancers, and African acrobats. It is always updated with the latest trends since it works closely with the Bollywood artists. Hot Crazy Events & Entertainment is a anchor based out of Delhi . Hot Crazy Events & Entertainment's telephone number is 76-66-77-88-99, Hot Crazy Events & Entertainment website address is http://hotcrazyevents.com/, Facebook page is Hot Crazy Events & Entertainment and address is Pandav Nagar, New Delhi, Delhi 110092, India. Hot Crazy Events & Entertainment is mainly known for Sangeet, Wedding Reception and All Social Events .. In terms of pricing Hot Crazy Events & Entertainment offers various packages starting at Rs 30000/-. There are 1 albums here at Weddingz -- suggest you have a look. Call weddingz.in to book Hot Crazy Events & Entertainment at guaranteed prices and with peace of mind.